Demonstrate Scout spirit by living the Scout Oath and Scout Law in your everyday life. Earn a total of 21 merit badges including the following: first aid, citizenship in the community, citizenship in the nation, citizenship in the world, communications, personal fitness, emergency preparedness or lifesaving, environmental science, personal management, swimming or hiking or cycling, camping, and family life. While a Life Scout, serve actively for a period of six months in a position of responsibility. While a Life Scout, plan, develop, and five leadership to others in a service project helpful to any religious institution, any school, or your community. The service project involves a specific number of hours and must be approved by the scouting program. A Scoutmaster conference is when a candidate for Eagle has a meeting with his Scoutmaster to review everything he has done and to make sure that he is on track to receive his Eagle award. An Eagle Scout board of review is similar to a Scoutmaster conference, only it is done after all of the requirements for Eagle are completed and it includes other leaders from the scouting program. 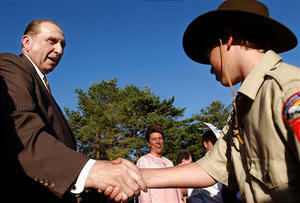 When a scout has received his Eagle a special Court of Honor is usually held. It is a formal ceremony where scouts receive their rank advancement. Awards are also presented to an Eagle Scout's parents for helping him achieve such a high honor. New eagle scouts are encouraged to continue living by the Boy Scout spirit and to continue in the Scouting program as an example and leader. Young men, take full advantage of the Church programs. Set your goals to attain excellence in the achievement programs of the Church. Earn the Duty to God Award—one of our most significant priesthood awards. Become an Eagle Scout. Do not settle for mediocrity in the great Scouting program of the Church (Ezra Taft Benson, “To the ‘Youth of the Noble Birthright,’” Ensign, May 1986, 43). Brethren of the Aaronic Priesthood, set your goals now and start working toward earning your Duty to God Award and Eagle Scout Award. You will be blessed for your efforts (Robert D. Hales, “Fulfilling Our Duty to God,” Ensign, Nov. 2001, 38). This page was last edited on 24 October 2013, at 15:46.